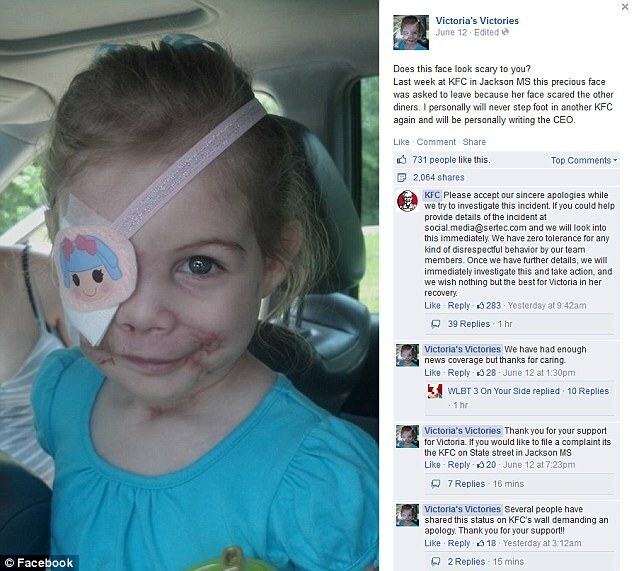 Claims KFC Turned Away 3-Year-Old Because Of Scars Are A Hoax? However, an unnamed source involved in the current investigation has stated that in fact, the incident was a hoax, and that there are many inconsistencies and holes in the allegations. For starters, Mullins stated that on the day of the incident, she had ordered sweet tea and mashed potatoes with gravy. However, when reviewing transactions on the day in question, it was found that neither of those items were included in the same order at any point. Additionally, when reviewing surveillance tapes of both the alleged branch in question, and another in Jackson, the CCTV showed that the grandmother and little girl didn’t even visit the restaurant that day. The cause of the allegations, if false, has been put down to an attempt to raise money for Victoria. Before the incident, the family had managed to raise just $600 on a gofundme.com website. However, after the story hit the headlines the public were extremely supportive, and a total of £135,000 was raised, alongside a $30,000 donation from KFC. Las Vegas plastic surgeon Frank Stile also heard about the story, and flew out to Jackson to pledge a donation to cover the costs of reconstructive procedures, likely to amount to tens of thousands of dollars. KFC have stated that regardless of whether the accusations made against them were true, they will still donate the money in support of Victoria’s recovery. Many are arguing that all the money donated should be given back, however surely this little girl should not be punished, as the cause remains a good one.